Campbell Scientific dataloggers are well known for making meteorological and hydrological measurements. Much of our early product development benefited agricultural researchers and others who needed remote, stand-alone monitoring of environmental parameters. However, it wasn't many years after the company's inception that our dataloggers found a place in an industrial application. This occurred early in 1983 when Eric Campbell and Art Heers traveled to Kapuskasing, Ontario, the location of a General Motors cold-weather test track. A GM engineer was interested in seeing how the new CR7 datalogger could solve his vehicle testing needs. It didn't take long to show GM engineers that the CR7 could withstand the extreme cold (subzero temperatures), produce plotted results within minutes of the tests, and, as a small box in the seat of the car, provide more measurement functionality than a trailer full of their other measurement gear. Since that trip, our systems have been used by major automotive companies in the US and around the world, as well as many of their suppliers. Vehicles outside of the automobile industry have also benefited from our dataloggers. These include military vehicles, agricultural equipment, construction equipment, and motorcycles. Even the performance racing industry has used our dataloggers. Vehicle-testing applications typically involve measuring a variety of speeds, pressures, temperatures, forces, or noise in an effort to verify designs, fine tune performance, and support research. Sensor types often used in this industry include thermocouples, pressure transducers, pulse pickups, flow transducers, potentiometers, strain gages, load cells, digital switches, accelerometers, LVDTs, and tilt sensors. Since the release of the CR7 in 1983, we've designed other dataloggers with additional capabilities to support the automotive industry. These dataloggers feature higher channel counts, faster measurement speeds, and larger data storage media than those used for environmental monitoring. Reliability: Our dataloggers can withstand extreme temperatures, shock, and vibration. Size and portability: Even our largest unit, the CR9000X, can easily fit on a single seat of a car. Versatility: Our systems provide a wide range of configuration options and programming flexibility. Not only can test engineers configure systems using a wide variety of sensors and measurement peripherals, but they can create custom programs to get the exact data they want. 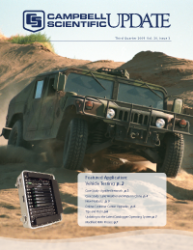 CANbus support: Vehicle computer data can be synchronized with the test measurements. Technical support: Our application engineers help customers get the most out of their test systems. The automotive industry is currently going through some slow times. Fortunately for some, many of those CR7 systems that were sold back in the 80s are still producing quality measurements, even after 20 years. Look for Campbell Scientific to continue to provide innovative measurement instruments to meet the needs of vehicle-testing and performance-monitoring applications.